Aces and Faults recaps the week in tennis. Last week, Roger Federer topped Novak Djokovic to win his seventh title in Dubai, while Lucie Safarova took the title in Doha with a win over Victoria Azarenka. Rafael Nadal also won his first title of the year in Buenos Aires and David Ferrer continued his run of titles with a win over Kei Nishikori in Acapulco. Roger Federer: The No. 2 bested top-seeded Novak Djokovic, 6-3, 7-5 to win the Dubai Championships for a record seventh time. It's Federer's second title of the season and he notched his first win over Djokovic in a tournament final since 2012. It's no secret that the quick conditions in Dubai have historically favored Federer, who has made Dubai his training base. "I also think I had a rough first visit here to Dubai where I was accused for not putting in my best effort, I remember, and I came back the following year and won it and went on a roll," Federer said. "I really felt like I had something to prove after that, and I guess that's what got me to my winning ways here in Dubai. And then ever since then I fell in love with the tournament and the crowd and the city here. The seventh is quite unbelievable, what I hear people talking about that, announcing I'm the seven‑ or six‑time winner here in Dubai. Sounds pretty crazy." David Ferrer: For all the focus on the next generation of ATP stars potentially breaking through this season, it's the older set who have dominated the headlines. At 32-years-old, Ferrer has rebounded from an arguably disappointing 2014 to win three of the four tournaments he's played. Compare that to his last two years, where he won three titles in 49 tournaments. After winning the Rio Open on clay two weeks ago, Ferrer switched over to hard courts and tore through the draw in Acapulco, beating No. 5 Kei Nishikori 6-3, 7-5 to become the first man since Ivan Lendl in 1985 to win back-to-back ATP titles on clay and hard courts in consecutive weeks. ​Lucie Safarova: It's easy to forget that Safarova made the Wimbledon semifinals last year. The Czech No. 2 has been overshadowed by Petra Kvitova and, in recent months, the rise of Karolina Pliskova. But ever since she paired up with coach Rob Steckley last season, Safarova has shown steady improvements in her consistency. She won the biggest title of her career at the Qatar Open on Sunday, with a 6-4, 6-3 win over Victoria Azarenka in the final. She's now up to a career-high No. 11 ranking and is less than 200 points behind the No. 10 spot. Rafael Nadal: Finally. No one wanted to have to write the hand-wringing pieces if Nadal failed to walk away with the title against a soft field in Buenos Aires. The Spaniard got on the board with his first title since winning the French Open last year with a 6-4, 6-1 victory over Juan Monaco in the final of the Argentina Open. Like Federer, Nadal did not lose a set all week—that should help his confidence. Timea Bacsinszky: The former Swiss prodigy punctuated her comeback by winning her first WTA title after a 6-3, 6-0 win over Caroline Garcia in the final. Now 25-years-old, Bacsinszky was studying hospitality services and prepared to walk away from her once-promising (but then fledgling) tennis career in 2013. But an email announcement informing her she was eligible for qualifying at the 2013 French Open kick-started her comeback. A year ago she was ranked outside the Top 100, but she scored big wins over Maria Sharapova last fall in Wuhan and Petra Kvitova this year in Shenzhen and now she's up to a career-high No. 31. Ryan Harrison: The 22-year-old had a slump-snapping week in Acapulco and earned his first Top 10 win by defeating Grigor Dimitrov 7-5, 4-6, 6-0 in the second round. He followed the win up with a 4-6, 7-6, 7-6 victory over Ivo Karlovic to make his first ATP semifinal since the summer of 2013. Once on the verge of falling out of the Top 200, Harrison is now back up to No. 109. ​Victoria Azarenka: She fell one match short of winning her first title since 2013, but this was a fantastic week for Azarenka, who showed her trademark grit and quality to beat Angelique Kerber, Elina Svitolina, Caroline Wozniacki and Venus Williams to make her first final in over a year. She's back in the top 40 at No. 38 and playing top 15 tennis. ​Borna Coric: Djokovic told reporters he feels like he's playing himself when he practices with the 18-year-old Croat. Federer told reporters to hold off and not saddle the teenager with those shorts of "Nole 2.0" expectations. The debate surrounding Coric's prospects will continue as he grinds away on tour. But with his 6-1, 6-3 win over Andy Murray in the Dubai quarterfinals, he's now beaten two of the ATP's Big Four in his last seven events while making two semifinals. You've got company, Nick Kyrgios. Barbora Zahlavova Strycova: You feel like you got robbed on a call. You lost. You're mad. All these are understandable. But Zahlavova​ Strycova also shot a searing glare at Venus Williams and Venus asked the question that was on all our minds: "Was that look for something?" ​Grigor Dimitrov: The Bulgarian just hasn't been the same since he blew that lead to Andy Murray in the fourth round of the Australian Open. That's now back-to-back second round losses for Dimitrov, who fell to Harrison in Acapulco. He lost to Gilles Muller a week earlier in Rotterdam. Andy Murray: It's no post-Australian Open slump by his standards, but his two back-to-back quarterfinal losses in Rotterdam (Gilles Simon) and Dubai (Coric) were incredibly flat matches that seemed to come out of nowhere. Quizzical. Petra Kvitova: Since winning the title at the Sydney International, Kvitova is 4-3, with two of those losses coming in the Middle East to Carla Suarez Navarro. Maybe it's just a match-up issue? Magdalena Rybarikova returns the ball to Sharapova during the Mexican Open. 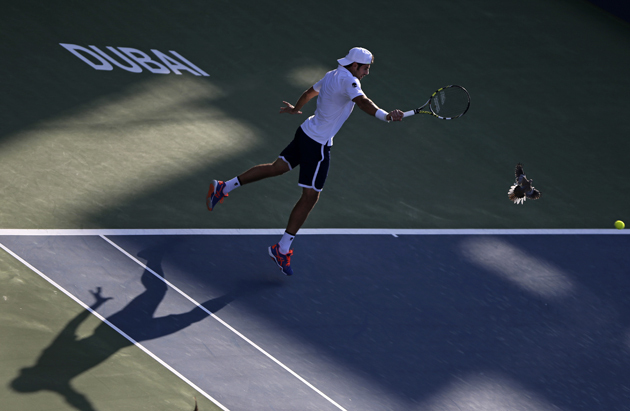 Simone Bolelli returns the ball to Tomas Berdych in Dubai as a pigeon flies over the court. - Azarenka had no problems beating Wozniacki 6-3, 6-1 in the Doha quarterfinals, but their match got a little bit of spice after a blown call and a broken Hawk-Eye machine led to one of the more amusing on-court scenes of the week. Serving to stay in the first set at 30-30, Wozniacki looked to hit a clear double-fault. The second serve was instead called a let, giving Wozniacki a second serve. Azarenka called for Hawkeye and the system was down, meaning the blown call stood. She couldn't believe it, argued with the umpire and then Wozniacki got into it. The Dane demanded she should receive a first serve because of the delay created by Azarenka's arguing. That's a pretty "gutsy" ask there, Woz. - Martina Hingis and Sania Mirza will pair up for Indian Wells and Miami. - Sloane Stephens' struggles continue. 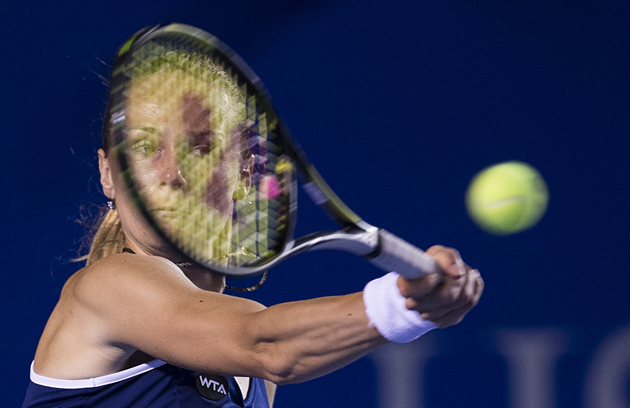 In her first tournament since the Australian Open, she lost to Johanna Larsson 6-3, 6-2 at the Mexican Open. She's on a three-match losing streak and hasn't won back-to-back matches since Cincinnati last year. - Just to clarify some weekend confusion from the ATP on Guillermo Vilas' record of clay titles. Though it was initially stated that he had won 46—and thus Nadal tied him with his Buenos Aires win—the ATP confirmed Vilas won 49 clay court titles in his career. Have to think Nadal will catch him this spring. - After yet another poor performance, Angelique Kerber has split with her coach, Benjamin Ebrahimzadeh. - Must read: This Andy Murray interview offers incredible insight into his psyche. - Eugenie Bouchard withdrew from this week's Monterrey Open citing a forearm injury. - The most disappointing thing about Maria Sharapova being forced to withdraw from the Mexican Open with a stomach virus is it killed any chance we may see her in a sombrero. - It was surprising to see Djokovic go 0 for 7 on break points against Federer in the final. He has Davis Cup duties this weekend and then he goes to Indian Wells and Miami to try to defend his titles. - This stat snuck up on me: There are now four Czech women in the WTA Top 20: Kvitova, Safarova, Pliskova and Zahlavova Strycova.